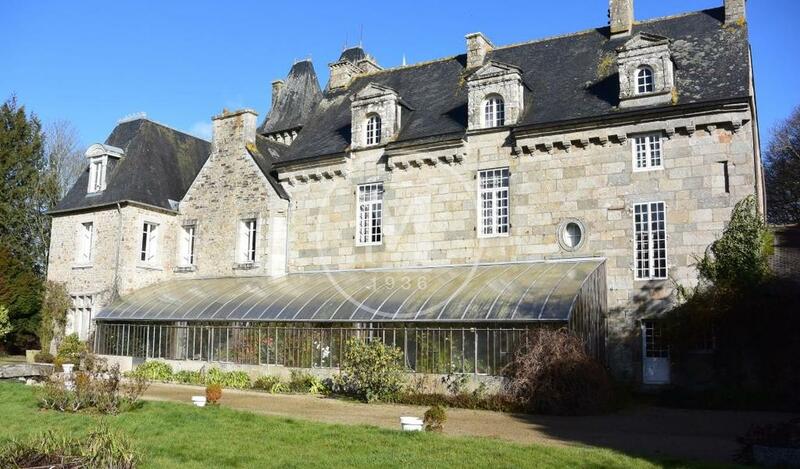 For sale, listed Chateau near Landerneau. 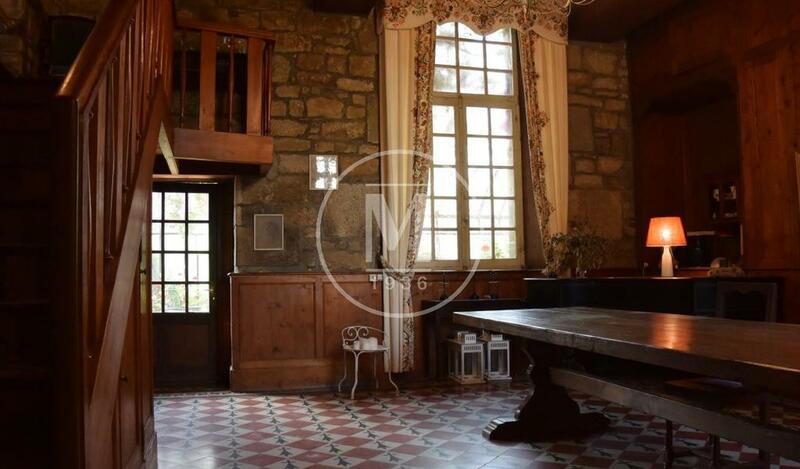 A few kilometers from the road RN 12, near a dynamic large village, and on the edge of woodland delimited by secondary roads, beautiful property with a stunning park, woods and buildings surrounding a listed Chateau. Accessible by a beautiful driveway bordered by an old building, a high granite gate opens onto the Chateau. This Large and beautiful Chateau, has been built first in 1594 (dated above the door), and enlarged in the late 19th C in a style very respectful of its original appearance. The arrival facade presents a superb listed door and beautiful skylights on high roof, also listed. The facade onto the park, south facing, is bordered along the length by a period flowered greenhouse used as a winter garden. The property offers approximately 750 m2 of living space. The ground floor of the old part consists of a hall and a large lounge room decorated with a huge listed fireplace, its windows are high and wide to let in the light. In the newer part, the partitions were knocked down to create a reception area of about 140 m2 with tiled floor, cloakroom and toilets in the basement, adjoining catering kitchen and independent exits. On the floors, there are 11 bedrooms, some of them are large and elegant. Almost all are equipped with bathroom or shower room. There are enough toilets. The structure of the building is very healthy thanks to regular maintenance.